Goa was once a land of verdant beauty with its any fields glowing with crops. Gradually it is beginning to resemble a concrete jungle, ravaged by the contrivances of land sharks and builders. Agriculture was once the mainstay of this tiny state, but today a considerable amount of land lies fallow. The owners of the fields, in most cases, have given up cultivation owing to the costs involved and the lack of manpower. The revival of agriculture as a primary occupation and the recommencing of cultivation of this fallow land must be armoured by the development of a scientific approach. For this, however, trained manpower is required and agriculture is not a subject available easily at an academic level. It was for this reason that the Ramanata Crisna Pai Raikar School of Agriculture (RCRSA) came into existence under the patronage of well-known businessman and erstwhile president of the GCCI (Goa Chamber of Commerce and Industry) Mr Manguirish Pai Raiker. The school has 11th and 12th standard classes and is located in Savoi Verem, Ponda in Goa. The school does not charge its students any fees. Human Development Economist Dr Santosh Mehrotra, who drafted the NVEQF (National Vocational Education Qualification Framework), now known as National Skills Qualifications Framework; became actively involved in the process of creating a syllabus by conducting a course writing seminar in Goa. The outcome was the evolution of a well-designed course which was scrutinised by the Academic Council of the Goa Board of Education and approved. The syllabus acted as the foundation of the school as the infrastructure was designed and built to suit the course requirements. The syllabus comprises of 25 per cent theory and 75 per cent practical work. This is because the importance of manually working in the fields to gain practical experience was stressed rather than just gaining theoretical knowledge. 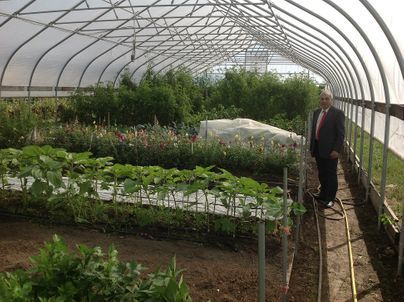 Two polyhouses have been set up, each dedicated to horticulture and floriculture respectively. There is a shade net house for a nursery where different seedlings are grown and then distributed to farmers. Students are made to raise flowers and plants as homework assignments, and teachers visit these students to check on their progress. ‘It is a gurukul type of system,’ comments Mr Raiker. The farmers in and around the Goa have been extremely forthcoming in their efforts to help the institution and the students. Farmers involved in different types of crop cultivation take students on for training on the job for at least three months. A co-operative of farmers has been established which is attached to the school. Here students assist the farmers clearing the fields, sowing seeds, controlling pests, dispensing the correct fertilisers, harvesting and preparing the crop for the market. The scientific approach to each of these stages, especially the fertiliser used, is of significance as the quality of the crop depends on the right treatment. ‘There was a co-operative group carrying out watermelon farming a while ago and this was covered by a television channel. It has become a source of motivation to other farmers in the state, which is a good thing,’ says Mr Raiker. In the case of fallow lands, farmers were requested to allow students to cultivate a crop in a small plot on the land and the farmers would be allowed to retain the yield that was harvested. The efforts of the students had a double effect in that they not only succeeded in reaping a good yield, but their work convinced the farmers to cultivate the entire field. This sort of work was carried out at Vaghurme, Ponda and Bicholim. The good news is that farmers have continued cultivation in these areas. Soil testing has been encouraged among farmers with students taking samples of soil and sending them to the government laboratories to be tested. Since farmers are not aware of how soil must be selected for testing, the students take on the task themselves. They then interpret the test reports for the farmers. Along with this, camps are held for farmers and the staff of the school teach about the chemical components of the soil they work with, concentrating on what variety of crop would grow best in a particular land and how the soil can be fortified. Though such facilities are supplied by the Government too, the impact is felt sparingly. You hear of campus placements at the undergraduate and the postgraduate level but at the Ramanata Crisna Pai Raikar School of Agriculture campus placement begins at high school level. More than half the students have already received placements some even with Zuari Agro Chemicals Pvt Ltd. and Goa Bagayatdar, Ponda, a farmer's cooperative. Those who have not been selected always have the option of entrepreneurship, nursery farming, landscaping and so on. There is a move to start diploma and degree courses that will feature under the community college scheme and will involve the National Vocational Qualifying Format. Since the major component of the syllabus will be practical work, a student can walk away with a valuable and applicable knowledge after just six months (one semester) of studying. With two semesters students will receive a diploma, with four semesters it will be an advanced diploma and with six semesters, a degree. This year diploma courses in agriculture and horticulture are available to students. Of the first batch of students more than 95 per cent have passed, with seven securing a first class. These students come from all over Goa and have a genuine interest in farming. Most of them hail from the farming community. This high school has become a boon to school drop-outs, who had less of an advantage in a solely academic setting, as well as others who are in need of employment. Mr Raiker praises the excellent teaching staff of the school under the able leadership of Principal Mr Shrirang Jambhale. Others on board are Dr V J Prabhu Desai, Mrs Divya Hazare, Dr Sachin Tendulkar, ex Director of Agriculture, Government of Goa, Satish Tendulkar, besides eminent personalities in the field of agriculture and horticulture as guest faculty. These have put together their assorted strengths to build up the school and lend it its present shape.